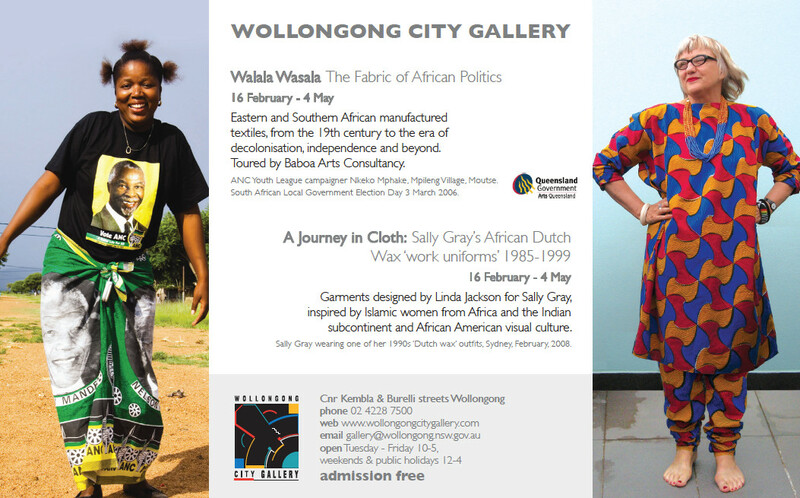 In 2008 Wollongong City Gallery invited Sally Gray to prepare a small exhibition to accompany a larger planned exhibition ‘Walala Wasala: The Fabric of African Politics’. Gray’s contribution investigated her personal relationship to African textiles, in particular the vibrant manufactured prints known under the generic name ‘Dutch Wax’. The aim was to explore the complex multi-directional exchanges and hybridity of this fabric tradition in its “long historical process of imitation and mimicry”. The mass-produced cotton fabrics – originally imitations of handcrafted Indonesian batik during the Dutch colonial period – were produced and disseminated by Dutch and English colonial powers, popularising ‘Dutch Wax’ in a range of foreign markets. In Africa where the designs were taken up with enthusiasm and imagination they are seen as quintessentially African.